Thanks to Boden for sponsoring today’s discussion! All opinions are 100% my own. The Holiday season is in full swing back in the states and I am definitely missing it! While European countries do celebrate Christmas, there isn’t as much of an emphasis put on the holiday…or at least yet anyways. Christmas is still 15 days away! Finding the perfect gifts for your girlfriends can be a bit difficult, but especially finding the perfect stocking stuffers for the stylish lady in your life! I found that Boden has helped me with some ideas to fill a stocking to open on Christmas morning. I even ordered a few items for myself and can’t wait til they make their way into my arms here in Europe (that means some fashion posts will be coming soon, yay!!). Scarves – While it’s not too cold in Rome yet, I know it is freezing back home. A big cozy blanket scarf is the perfectly cozy and stylish way to stay warm this winter! I actually just ordered this exact scarf and CANNOT wait for it to make it’s way to me in Europe! Skinny Belts – Another versatile and stylish item, skinny belts would be an easy item to place in a stocking! One in a fun leopard pattern would definitely be a hit! Card Holder – A practical and cute gift is another must for any stocking! Perhaps a card holder with a gift card to your fashionista’s favorite place to shop would be appropriate? Jewelry – What true fashionista doesn’t love jewelry? A few statement necklaces, bracelets, or rings would definitely do the trick! Cozy Socks – You know those thick cozy socks with the grips on the bottom that kids wear? I always loved getting them for Christmas as a child. Well, for a more adult upgrade, a pair of fair isle patterned sweater socks would feel ultra lux and so cozy! 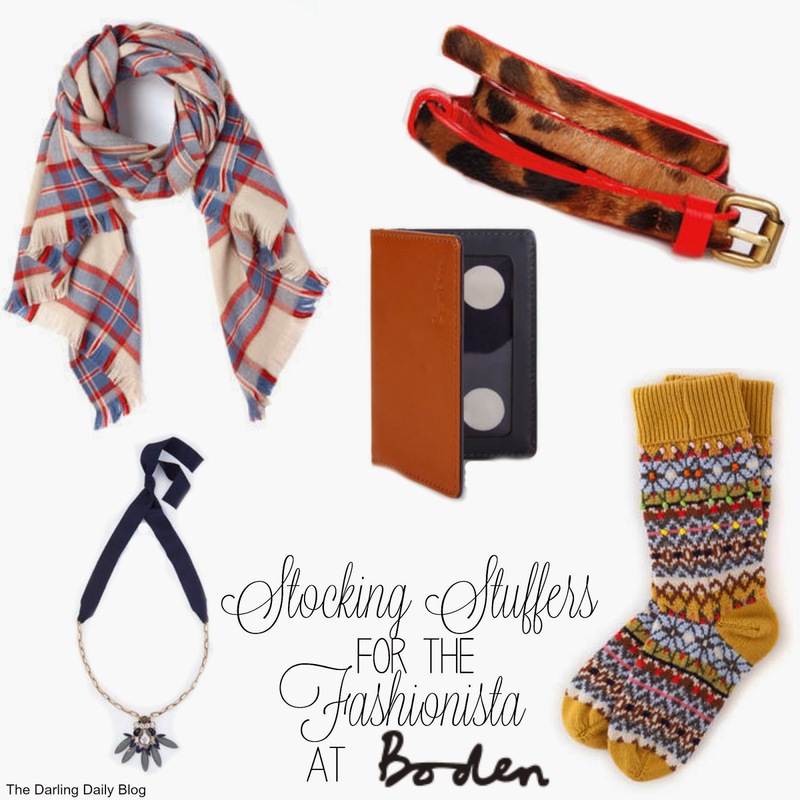 From Sunday, December 14th, 2014 to Sunday, January 4th, 2015, Boden will be offering up to 50% off EVERYTHING with code 9E3A! Can’t wait til Sunday to start shopping? Tonight you can use code HC25 to get 25% off everything and get free premium shipping! Click here to start shopping! What would you put in a stocking?